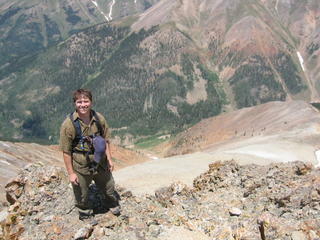 This weekend Nick and I joined Brian Romig, John, and Miles for a trip up three 14ers behind Lake City. We arrived at the Mill Creek Campground Friday night and claimed a spot for our tent. It was a long drive from Denver, so we sacked out early. 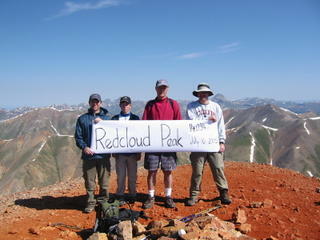 Saturday morning we drove to the trailhead for Redcloud and Sunshine. 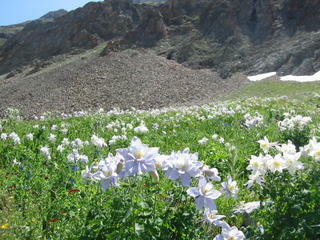 The hike was beautiful up silver creek with many wildflowers, including columbines! Silver creek is aptly named. The water flowing over gray-silver rocks makes the stream totally cool looking. In the upper valley we say a really fat marmot who was not pleased with our presense. The climb is easy all the way up the valley until you get to the final ascent of Redcloud. At this point it gets a bit steeper (class 2) and we left Brian a bit behind. The order was John, Miles, Don, Nick, Brian. Topping Redcloud produced a 360 panorama of the San Juan's. The one mile trip across the saddle to Sunshine was fun and we took some photos of the group with a sign that Brian brings on all his fourteener climbs. A couple from Utah made the climb with us. On the descent we split into two groups. John, Nick, and I decided to take the Sun Dog route, while Miles and Brian went down through the crags. The initial descent from Sunshine is steep and rocky... I'm glad we were headed downhill. The Sun Dog was rated 2+ and offered enough scrambling to be kinda fun. At a particularly steep point, I decided to get my picture taken, turned around too quickly and took a fall. Luckily my Camelback cushioned the landing and I did not fall the full thousand feet to the valley below! John had taken a spill earlier, so only Nick made the hike clean. That night we had beers and discussed the routes up Handies. John and Miles decided to go from the same trailhead again, while Brian, Nick, and I took the 4WD road up around to the easier ascent from American Basin. The road doesn't require 4WD, but does need some clearance. The scenery is breath-taking. There were quite a few professional photographers taking pictures of the basin. The columbine fields go on forever. The hike up is fairly easy, but very enjoyable. You pass thru some cool looking rocks and past an alpine lake. I had the peak to myself for about 5 minutes before John and Miles arrived from the other trail. 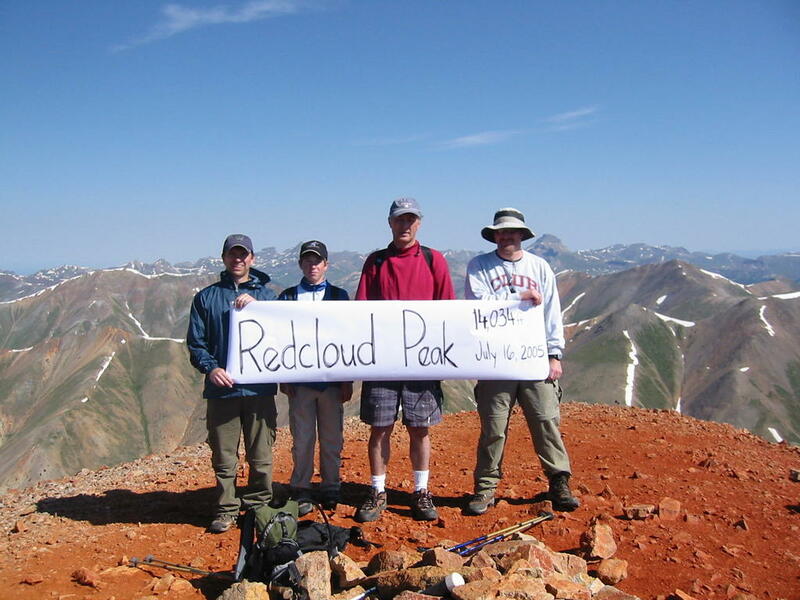 We met a hefty guy from New Mexico who summitted his first fourteener. So much for 14ers 8,9, and 10 for me! I decided to go ahead and use one of the big blogs so I can start posting until I find a blogging software package that I like to add to my site: www.donlyman.com.